Australian endurance rider Meg Wade remains in a serious condition in hospital, but is showing signs of improvement, her husband says. 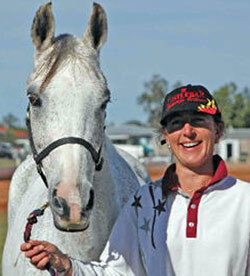 Wade has been in a coma since April 12 after a fall from her horse during an endurance ride at Tumbarumba. Wade's husband, Chris Gates, spoke to ABC Radio last week about his wife's condition and said the family has been overwhelmed by the support from the equestrian world. "The reponse from throughout Australia and around the world has been phenomenal. There's been hundreds of emails and cards - everyone is in shock. This is an injury that every horse rider fears. It happens, it's unfortunate. The riders all wear helmets but it's the fear behind everyone to have an accident that's so devastating," Gates said. He said no-one had seen the accident but it was near a checkpoint. "We feel that the horse shied at a large puddle. The lucky situation was that the accident was sighted because in that bush, it could have been devastating." Gates said the fall was a freak accident, and other than her head injury, "Meg never sustained another injury. There's not a mark on her body. "We have her helmet at home; there's a scuff-mark on the right rear quarter of the helmet, but when you look inside the padding is compressed by over 50 percent, and split. "And this is not a cheap helmet. The helmets Meg has aways worn are the same as what our Olympians - showjumpers and eventers - wear," he said. He said Wade's doctors are "very confident", which had come as a surprise to the family. "We had a brief meeting with the neurological surgeon at the end of last week and much to our surprise he was happy with her progress." Wade was still unconscious "but her conscious level is rising, which gives great hope for us. "The whole family is very optimistic - we've never lost our optimism but when you hear about these devastating injuries your legs get knocked right out from under you. You just don't know," Gates said.